Today many brand desktops and laptops have built-in one key recovery programs installed by vendors. Although these programs can help users to create system backup image quickly, they have limits in common. If you re-install the operating system or upgrade the system, the program may not work well. If you resize the partition, especially the system partition, merge partitions, the in-bulit program may not work well again. Because vendors bundled the software and the system. However, they do not upgrade the same. And the factory restore partition may be infected by changing the system. Why you need AOMEI OneKey Recovery Tool? In the world, a true fact is that DIY computer users are far more than branded computer users. For their machines, no integrated one click recovery tools are available, they need to find a third-party one key back & recovery software to protect their data. AOMEI OneKey Recovery, a freeware can satisfy most people’s needs. The latest version of AOMEI OneKey Recovery is 1.6. Before 1.6, there is only one edition of AOMEI OneKey Recovery and it is totally free. Since 1.6, there are several editions. Each edition gives you different choices. Professional Edition can enjoy all functions on PC, for instance: Backup system to other location, change the compression level of the backup, enable encryption for the backup, restore system from local disk or external disk and restore system by selecting an image file, set prompt time interval during start-up manually and hide the notice info at boot. Family Pack edition has the same functions as Professional, and it can be used on Windows Server as well, 4 PCs or Servers. Professional is for 1 PC. Technician Edition has full functions and is for unlimited PCs. Customization has all functions and is for unlimited PCs, Servers and can be customized logoUI and rebrand. If you prefer to backup fast and recovery fast, no other settings, the default free edition is perfect. That’s why this simplest edition is used by most people. After know about the difference between editions, let’s see how to use it, take free edition as example. How to use AOMEI OneKey Recovery? Download it from AOMEI site, install and run. Its main window as following picture shows. There are two big buttons on the screen. Additional options are from the top setting menu. Click OneKey System Backup button on the left to start, and click next next next, you will complete the task. To recover, you can restore your computer to its factory default or a previously backed up state by pressing “F11” (default) or “A” key during system startup.Forcomputers with EFI/UEFI boot, you can even enter to the program to recover system by using Windows boot menu. 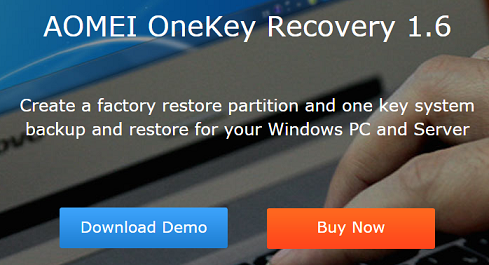 AOMEI OneKey Recovery is easy to use. Either newbie or lazy man could handle it quickly. If you pursue system security, AOMEI OneKey Recovery is a great choice.